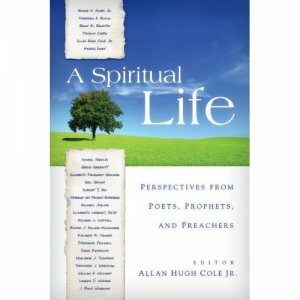 This revealing collection edited by Allan Hugh Cole, Jr., presents a selection of two dozen poets, prophets, and preachers who share their understandings of what makes a “good spiritual life.” They draw on their professional experiences and, as important, grace us with their personal thoughts. The result is essentially a textbook for spirituality courses, exposing readers to the spiritual lives of a wonderfully diverse group of people with a wide range of Christian experiences. Every reader is sure to find a perspective with which he or she can identify (from The Thoughtful Christian). Gaucher’s essay, Rebranding a Life: Spirituality and Chronic Illness, was named as “one of the most powerful essays in Allan Cole’s anthology” by the acquisitions editor for Westminster John Knox Press. I am very impressed by Gaucher’s writing and perceptive take on the world around her; the latter can’t be taught, even by a good editor. — Jana Riess, Ph.D., editor, author, blogger.